England manager Roy Hodgson has no sympathy for players who suffer from boredom at the World Cup. John Terry and Wayne Rooney both publicly drew attention to the issue in South Africa four years ago. Hodgson is acutely aware his players, who will be based in Rio de Janeiro, must find ways of filling the long hours away from the training ground. But he said: "You sign up for the World Cup as it's going to be. It's not our job to keep them occupied." In South Africa, where England were based on the same site as their training ground, players complained they were given little freedom by then-coach Fabio Capello. The environment was far more to their liking in Krakow at Euro 2012, given the almost complete absence of England fans. A beachside location in Rio is unlikely to be so relaxed, which may condemn the players to long periods in their hotel rooms, as was the case in South Africa. "There will be only one training session a day and a lot of free time," said Hodgson. "They are not going to be with their wives, they are not going to see their kids." Hodgson, who took Switzerland to the last 16 of the 1994 World Cup, likened the experience to that of service personnel in Afghanistan. "It's like a soldier saying he'll sign up for the army but doesn't want to see any action, then complaining he is bored sitting around the barracks every day with nothing to do," he said. "There will be leisure activities. But we have 23 different players. You can't put something different on for each one. "It's a complete nonsense, one of those silly excuses that people use." 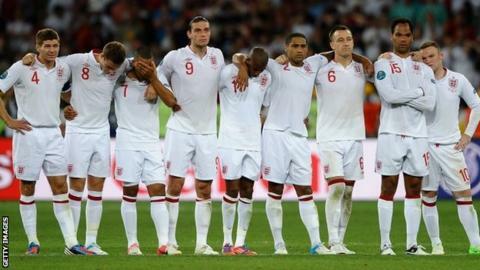 Hodgson will name his 23-man squad, plus seven standby players, on 12 May before confirming his final party on 2 June.